Most of us will be using a light to find and identify--to get answers to the questions that arise, for instance, when you hear that proverbial bump in the night. An alternative to the neck index hold is the neck crossover hold, which can be better for large-framed people as it reduces your overall width. 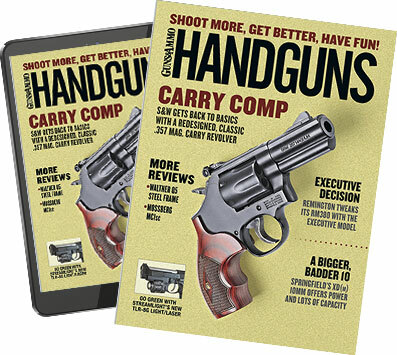 Any discussion of how to use a flashlight defensively along with a handgun has folks being advised to learn a half-dozen or so methods of combining gun and light and then to practice those until they're able to shoot well while doing so. This is fine, but the primary and most important purpose of using the light is to be able to move safely, search well and positively determine what it is that prompted you to pick up light and gun in the first place. Most of us will be using a light to find and identify--to get answers to the questions that arise, for instance, when you hear that proverbial bump in the night. The answer can be as simple as a family member coming home late or a pet running around the house. Or it could simply be gravity working. A heavy vehicle may have driven passed your house, causing something precariously perched on a shelf to fall to the floor, or perhaps there was an unexpected knock at the door. How does this bear on using gun and light together? Well, if you can determine the noise is actually a threat or threats, the next question becomes, Which of the various methods of combining light and gun do you use? My own preference is the neck index, which also seems to have been the consensus of those shooting the SureFire Dark House stage at the 2010 United States Practical Shooting Association's Multi-Gun Championship, as reported by Robin Taylor in USPSA's Front Sight magazine. In this stage, the shooters entered a totally dark "house" with just enough time to grab pistol and light before the door was closed, leaving them in total darkness. When asked how they managed the flashlight, almost to a man they used a neck index, according to Taylor. Most said that grabbing a light from a table and working it into a "cigar hold" (light in your support hand, rear tail-cap switch pressured by the palm of this hand, while gripping the pistol with your fingers) took too long. And one top shooter added that the neck index technique produces better light on a gun's sights. There's no mystery about the neck index. Just hold the light at about neck height while bringing your gun on target. A tail-cap pressure switch works better for me than a side switch, but the latter can still be operated with a finger. I hold the light diagonally across my chest and bring my gun up into the light beam. I've found that, given my size, doing otherwise occasionally causes me to hit the edge of a doorway or other vertical object while passing through or by them during a search. And, as pointed out above, this technique also illuminates my sights. Using the neck index gives you a free hand as well. You're not intertwined in a two-handed hold, and you have the ability to move your gun in a wider arc to the side and to the rear. And from the neck index you can easily move into any of the two-handed light-and-gun techniques--something you'd need to do if a shot presents itself that's beyond your one-handed shooting ability. As to selecting the light itself, I have and use lights from some of the big-name manufacturers, and they perform exactly as advertised. I have three models from Insight Technology--the HX120 Covert, HX150 Tactical and the HX200 Duty Size--that get larger as their light intensities increase. My suggestion is to buy as much light as you can afford because a good light is like a good defensive handgun. I follow the maxim, "One light is none; two lights are one," which means reliability, followed by run time, are my primary concerns in buying a light. More light is always better, but it comes at a price of size, weight and cost. I have a nightstand light with enough illumination to literally blind someone temporarily, but it is not one I'd choose for any event measured in hours rather than minutes. Another feature I like in a light is to be able to refocus the beam from narrow to wide because sometimes you might want to see as much of the whole area as possible at once; threats don't cooperate by standing still while you look for them. I also like a light sturdy enough to be used as an impact weapon. Just be sure to keep in mind your main purposes for the light: avoiding obstacles; finding whatever it is you are seeking; determining if it's a threat; and, if it is a threat, ascertaining that threat's intent and ability. And don't forget to practice your one-handed shooting skills.